Your users aren't going to report errors. Errorception is a great way to find those errors. In your code! Stop guessing! 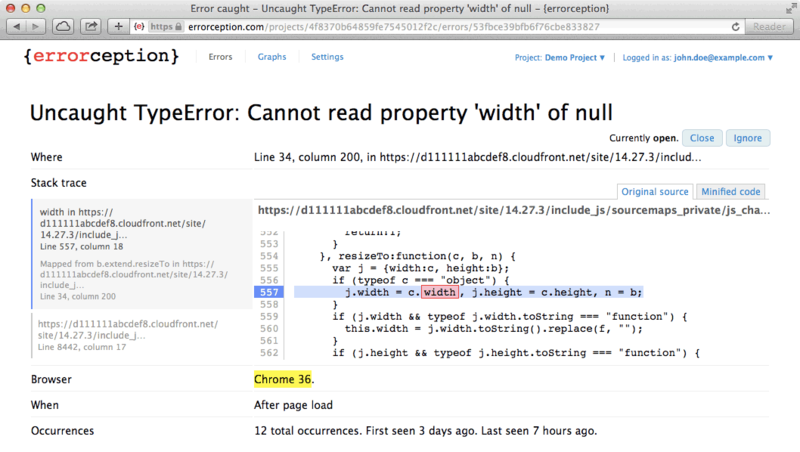 Errorception points to the exact cause of the error, right in your source. Detailed occurrence stats and raw error data (not shown) let you drill down into every individual error occurrence. 30-day free trial. No credit-card needed. See your errors pointed out right in your own code. Investigate errors easily. Source maps are applied automatically. You don't need to bother with minified code. Errorception causes no load-time performance hit. Your site operates at top speed. Errorception groups errors together, so you don't sift through raw logs. I have Errorception running on modernizr.com and mothereffinganimatedgif.com and it's provided massive insight in problems I wouldn't have tested for. Don't worry, this script tag will not affect your page's performance at all. Yes, zero performance hit! Read about Errorception's performance passion.